CreekSide RV Park & Campground is located just outside historic Albany, Georgia. We invite you to stay at our quiet, wooded campground with a rural setting, yet convenient to shopping, dining and entertainment. 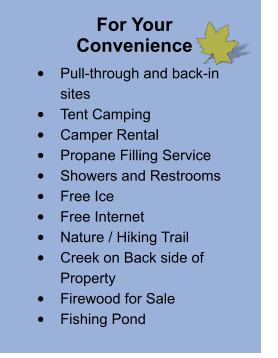 With over 60 campsites, we are a family-friendly campground and pets on a leash are welcome. Pull- through sites are available and you have Internet, showers and restrooms for your convenience. Children enjoy our play area and you can fish in our catch and release pond, enjoy hiking, or just relax at your campsite. We're here to help make your stay an enjoyable one.